Rubycon is the Tulsa, OK duo of Patrick Kurz and Doug Smith, who have joined the legion of home-based recording artists that haven't felt the need to wait around for an established label to grab them up. Kurz and Smith employ lots of different instruments in the 100% live recording, but synthesizers, synth-guitar, and various other electronic devices provide most of the arsenal employed. Tape loops and drum machines are used in a couple spots, but not so much as to remove the human element from the overall sound. Over the 10 tracks offered (totalling about 70 minutes), the pair explore whatever galaxies and nebulae that haven't already been charted by the likes of Cluster and/or Harmonia. Rubycon's self-titled debut opens with the gurgly, metronomic "Slip Tab into Time," an effective though simple piece with a pleasing light synth melody. The duo's experimentations with freakish sounds continue in the next several tracks often in the form of buzzers, bells, squeals, violins, etc. atop a pulsating electronic soup. In "...And then the Frogs Came," several vocal samples are piped in (including what seems to be Sean Connery and then a woman with a Kiwi accent). The album's finest moment is "Dusting Christ," another instrumental/electronic work with some excellent interstellar sounds and some gliss-like guitar-synth passages towards the end. Stunningly beautiful sounds here. "Cold on the Mountain" features Kurz' own poetry (recited under heavy f/X), which leads into a bouncier, more deliberate electronic rhythm with sprinkles of bleeps and atmospheric sounds here and there. But for the untitled 10th track, the album wraps up with the very laid-back and hypnotic "Human Doins at the Gate," an appropriate finale. Rubycon's first effort is definitely a success, though without any real 'rock' tracks it's limited in the variety of material it offers. Any given Hawkwind classic is a constantly-evolving work between the experimental/ambient side and the crunching guitar riffs and pounding drums. The Rubycon duo have got that first aspect down pat, so I would just like to see what they could do together with (I almost hate to say it) a more traditional lineup of players (including rhythm guitar, bass, and drums). But then there are those times that you just want to chill out with just space music, and this one works just fine for that. 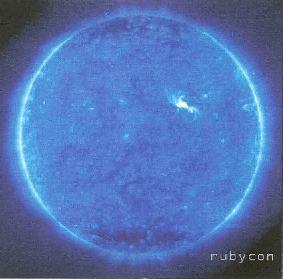 You can visit Rubycon at their web site. Sound files are available at their Mp3.com web site.